My wife, Therese, a businesswoman, joins other lay worshippers in a weekly prayer group called Daughters of Mary in which (among other things) one participant each week provides a spiritual reflection based on that week’s Gospel. This was my wife’s week to do so. I thought her insights well worth sharing, indeed better than my own this week, so the following is adapted from the notes for her oral presentation…. The answer that Jesus receives from His first question (Who do people say the Son of Man is?) is practical and a little cowardly: “We don’t really know who you are but everybody says… John the Baptist, Elijah, Jeremiah, a prophet….” The answer Jesus receives from Peter, by contrast, is courageous, inspired, from the gut, quick: “… but, of course, who else, but… You are the Christ, the Son of the Living God. ” Peter has departed his companions and exclaimed without hesitation his profound Messianic belief…. [Later in the column]…. [Aside: In my Revised Standard Version of the Bible, the words that Jesus exclaims after hearing Peter’s answer to his question, are “Blessed are you, Simon Bar-Jonah!” (This is Hebrew for “Simon, son of Jonah.”) I like the sound and the cadence of Simon Bar-Jonah! It effectively conveys Jesus’ amazement at Peter’s answer.] This is also the only time I can find where Jesus specifically refers to Peter by reference to his father. Why would he do so this time? Jesus sounds as if he is astounded – and delighted — by what Peter has said. His exclamation also evokes an immediate comparison between Peter, son of Jonah, and Jonah of the Old Testament. Jonah was a funny character. When God asked Jonah to go to Nineveh to plead for the people there to repent from evils committed against Him, Jonah immediately bolted in the exact opposite direction – as if he thought God couldn’t find him – boarding a boat for Tarshish. 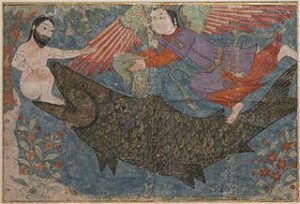 Of course God found him, blew up a storm, and Jonah found himself in the belly of a whale – where he asked for God’s deliverance. He received it and went on, reluctantly. He went into Nineveh, as God had asked him to do originally, and implored the people there to repent — which they did! …. [Still later in the column]…. What happens next is to me the great parallel between this charming story and our Gospel for Sunday…..